Communication and speech are very much related. The human ear and the voice are also related when it comes to speech and communication. Throughout this outdoor activity , I will attempt to explain and successfully show how the use of “Onomatopoeia” and the combination of the voice, the ear, and speech can help children become great readers and writers. The ultimate learning facility is the classroom. The entire school is a sound paradise. Within each room, there are sounds imaginable and unimaginable-children and adults are bombarded with constant sound. When focusing on Onomatopoeia, we must allow children to listen quietly and attentively. They will become experts to what makes what sound and they’ll be able to imitate it. They’ll be able to hear the sounds of the motor in a water fountain, the sounds of a fish tank, footsteps in the hallway, the click of pen and maybe outside sounds as well. There is really no limit to the way in which sound is perceived. We tried allow the children to explore the sounds outside. Discovering outside sound is great. Children can become more aware of outside sounds when their eyes are closed. The same was executed…..the children worked together in a group. 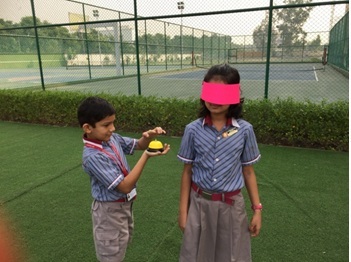 Each child was blind folded and one of the groupmember took an object and made it sound. Eg….bells, coins, twigs, paper, keys, whip, leaves, trumpet, pen etc. These are the sounds they hear everyday in the school. Being outside and exploring sounds was overwhelming and quite tranquil. The sound of wind blowing through the leaves of a tree, insects, or the chirping of birds enthralled the young learners. With the physical and not-so-physical environment, children can continue to become creative in their own unique way in learning to read and write “sound words”. Guidance through words, sounds, music, and prior knowledge of varied experiences can lead to dramatic academic gains for children. Sound is heard and created at all levels and volumes. The time has long since come when we as educators must relate the reality of our society in our educational institutions. Learning to read and write should be a pleasurable experience in our schools for all students.